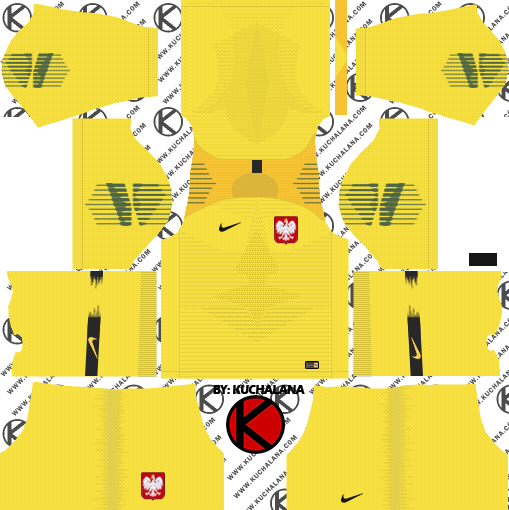 Poland 2018 World Cup kits for Dream League Soccer 2018, and the package includes complete with home kits, away and third. All Goalkeeper kits are also included. This kits alos can use in First Touch Soccer 2015 (FTS15). Both t-shirts make use of Nike's new Vapor template, adding a stylized cross band with horizontal cuts representing the eagle of the Polish national shield. The place is painted white, using some red on the neck and logos. The visit, on the other hand, is red, including the neck. Both t-shirts bring the eagle on the back of the neck and a woven graphic detail on the sleeves. 0 Komen untuk "Poland 2018 World Cup Kit - Dream League Soccer Kits"